Church Cove Beach at Gunwalloe, is a sheltered, south west-facing cove on the beautiful Lizard Peninsula in south west Cornwall. 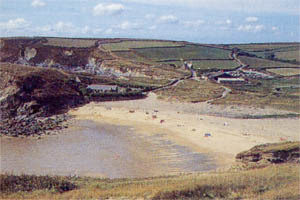 This is a popular family beach, with a small stream running across it that is ideal for paddling - Church Cove is an excellent beach for swimming and has life guard patrols during the summer months. The beach has a range of facilities nearby, including National Trust Parking and Toilets. The National Trust car park offers disabled access to the beach. Sat Nav Co-ordinates: N50º 02' 31.54" W5º 16' 12.81"
Dogs are allowed on the beach outside of the peak holiday season. 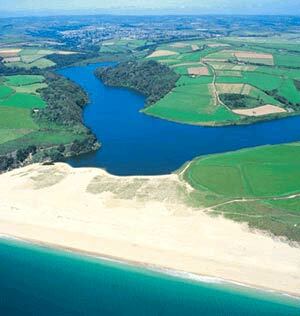 The area is designated as an Area of Outstanding Natural Beauty, and is part of a Site of Special Scientific Interest. 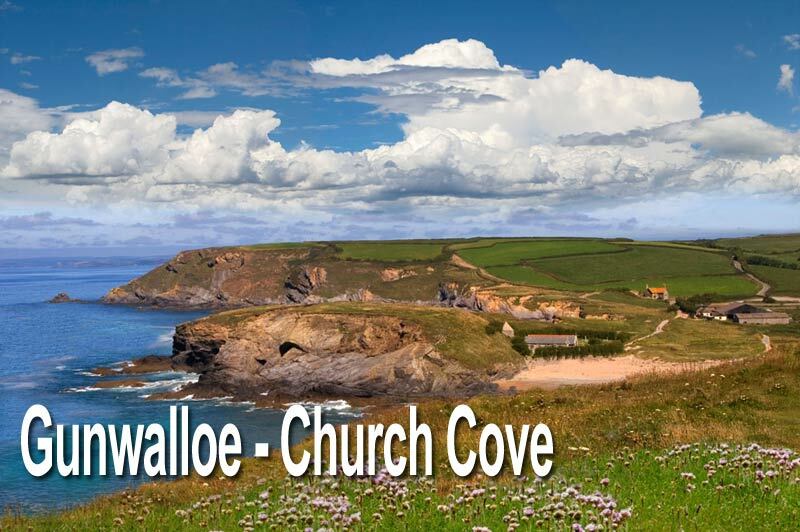 The beach gets its name from one of the more curiously-sited of Cornwall's old churches, the church of St Winwaloe (St Wynwallow,) at Gunwalloe. Located at the northern end of the beach, the church is separated from the sea only by the rocky hump of Castle Mound, whilst its detached bell tower is actually dug into the cliff side. The church is known as the Church of the Storms due to its unique and precarious position; which has frequently, over the centuries, had to be reinforced by the tipping of vast quantities of granite into the gap between the church and Dollar Cove to break the force of the waves. There was a major settlement here between the ninth and eleventh centuries, hence the siting of the church in such a seemingly isolated place. Today there is just church, farm and sandy beach - an idyllic spot, except in a storm. To the north is Halzephron Cliff, scene of many shipwrecks; the name comes from the Cornish als and yfarn, meaning 'Hell's cliff'. Nearby there is good food to be had at the Halzephron Inn. On the Cliff tops by the Loe Bar National Trust car park - between Loe Bar and Gunwalloe, is a memorial plaque commemorating the men lost at sea during the sinking of HMS Anson. HMS Anson was shipwrecked in 1807- the frigate was beached during a storm - locals were prevented from saving many of the crew due to the ferocity of the storm. The incident led to the invention of the rocket powered rescue system for ships in distress, by Helston man Henry Trengrouse. He originally named the device as the 'Bosun's Chair' - which later change its more common name the ' breeches buoy'.